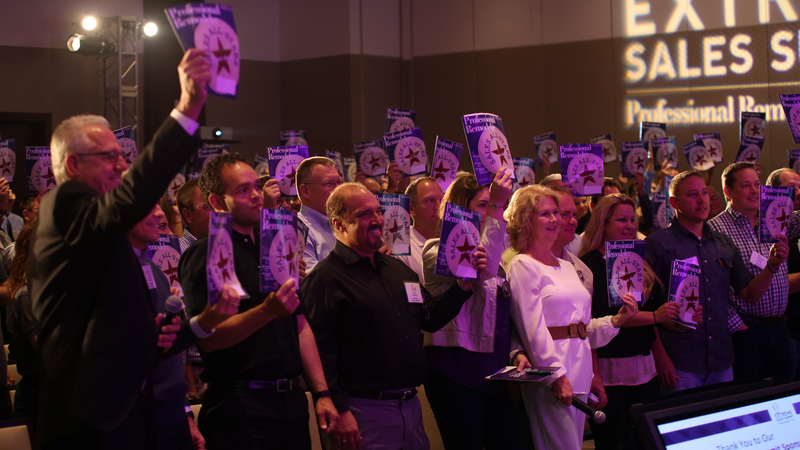 The concept of relative humidity (RH) is not well understood by lay people, but it also generates a lot of confusion among building industry professionals. Here is an easier way to explain RH that will help people understand why the concept is so important in building science. Relative humidity has to do with the amount of moisture air can hold. 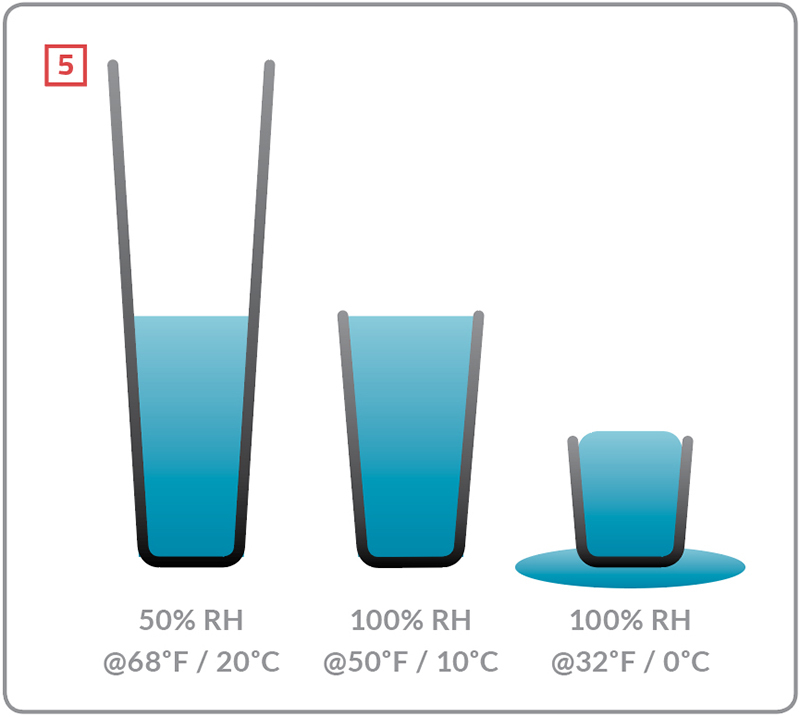 If we use a bucket to represent how much water the air can hold, then 100% RH means that the bucket is full . If the RH is 50%, that means the bucket is half full. Imagine indoor air as a bucket: If the bucket is full, relative humidity (RH) is 100%; if the bucket is half full, it is 50%. When we ventilate a house in a cold climate during winter, we bring cold air inside and heat it up. Outside air that is just above freezing is often near its limit to hold water—that is, the bucket is almost full. Assuming the outside air is saturated (100% RH), when we bring it inside and heat it up, the RH goes down. By the time the air reaches room temperature (68°F/20°C), the RH has dropped to 25% . When we ventilate a house with cold, moist air, the RH drops as the air warms. For exampIe, if the outside air is 100% RH at 32°F, the RH drops to 25% when the air reaches room temperature. But we also have sources of moisture inside the house, including cooking, bathing, drying clothes inside, even just breathing. 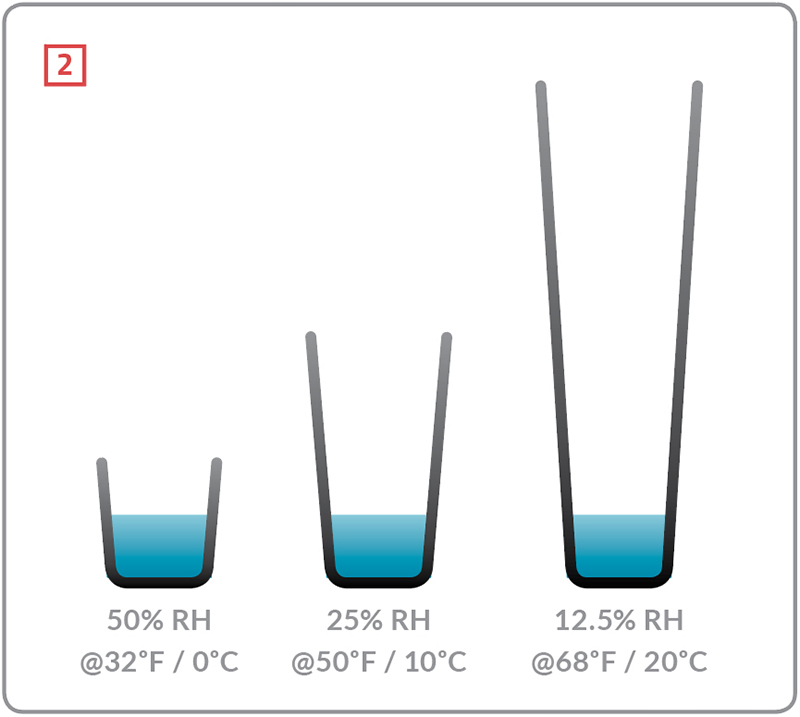 They all increase the amount of water in the bucket , which raises the RH. If they double the amount of moisture in the air, we could end up at 50% RH. One of the goals of a well-designed ventilation system is to maintain an RH below 50%, which is healthy and comfortable for occupants, and less likely to lead to condensation on windows. Inside sources of moisture—such as cooking, taking showers, and drying clothes—can raise RH, like a spigot filling a bucket. The goal is to keep RH below 50% to avoid health issues and condensation on cold windows. Building scientists are particularly concerned, however, when warm inside air leaks out into the exterior walls of the building, where it encounters surfaces that are colder than the indoor temperature. The closer the moisture-laden indoor air gets to the outside layers of the building envelope, the colder those surfaces get. And at each step along the way, the size of the bucket gets smaller and smaller. 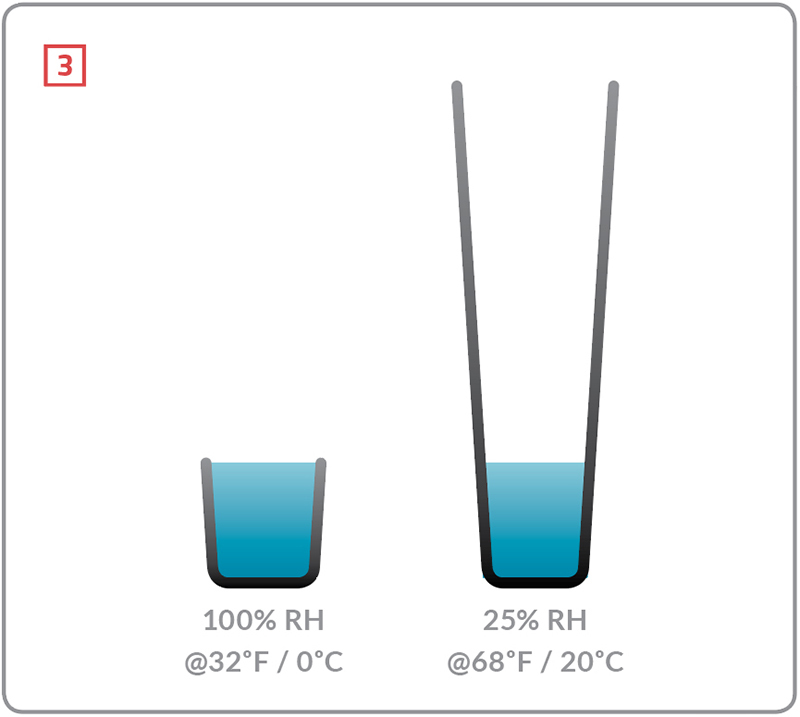 When air cools, the “bucket” gets smaller, so RH goes up. In cold climates, a loose rule of thumb is that the RH of air that leaks into exterior walls approximately doubles for every 18°F or so that the air cools. For example, when room temperature air at 50% RH cools to about 50°F, RH doubles to 100% RH. As that air continues to move toward the colder exterior, excess moisture will condense into liquid water that can lead to mold and mildew, and can cause deterioration of structural and finish materials. To continue our example, imagine that air at 68°F (20°C) and 50% RH leaks into a wall cavity where the temperature is about 50°F (10°C). The bucket shrinks by approximately half and RH doubles to 100% . If the air keeps moving toward the outside—or if the outside temperature drops significantly, cooling the building surfaces even more—the air becomes too cold to hold all of the moisture. 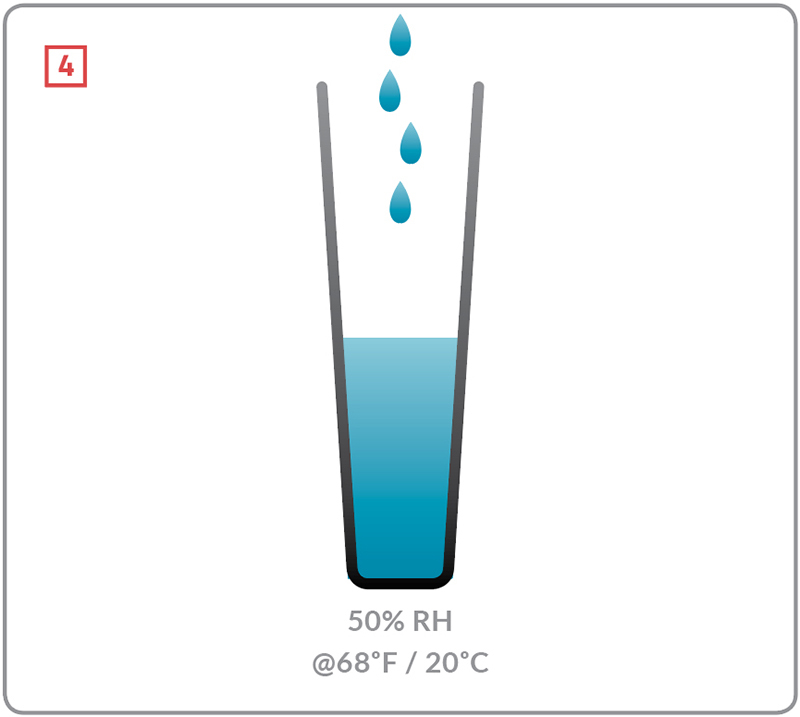 As the air temperature drops towards freezing, relative humidity exceeds the maximum 100% RH. At 32°F (0°C) the bucket is roughly half as big as it was at 50°F (10°C), so half the moisture in the air will have condensed on the cold surfaces inside the wall. 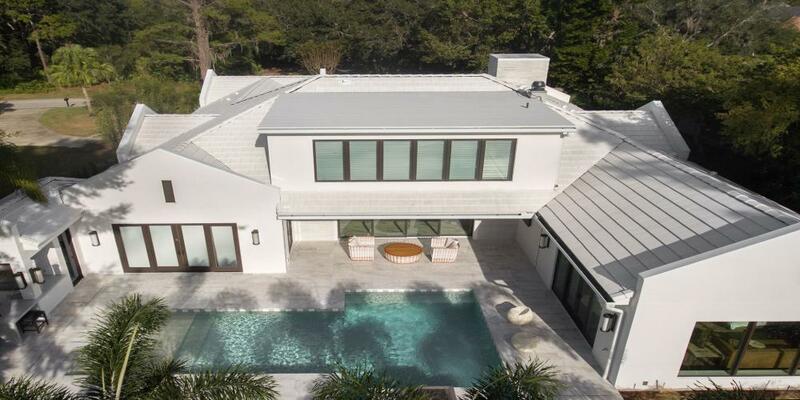 And that can lead to a host of problems for both the structure (including wood components, insulation, and finish materials), as well as the health of the occupants. Chris Schumacher, M.A.Sc., is a principal in RDH Building Science Laboratories in Waterloo, Ontario.